The Ohio City Bicycle Co-op has been an anchor for Cleveland’s biking community for years, maybe even before they had a physical space, or even a name. Jim Sheehan, the Co-op’s Executive Director, has been involved with Co-op since it was an informal group of bike lovers who got together with a cool idea back in 1995. “We did an earn-a-bike program and got hooked on teaching a kid to ride and keep their bike running, and they’re happy and smiling and you can go on to the next one,” Jim says. The program was a huge hit, and since then, the Co-op has grown significantly. They moved into a donated storefront in 2002, and then into a “little shack on the river,” along the Cuyahoga, before their community of bikers outgrew the space. In 2010, they moved into their current location on Columbus Road; a 16,000 square foot former industrial building that happens to sit across the street from their very first shop, a reminder of just how much they’ve grown. Looking to offer still more to their community, Jim and the OCBC recently wrapped up their first ioby crowdfunding project, and fundraised over $8,000 to replace workshop equipment and offer even more high-quality workshops. And as they look to grow, there are more bikers than ever before in Cleveland. Despite that growth the city has seen a net loss of bike shops in that time, making the support that OCBC offers all the more critical. They’ve become a key community hub for bike commuters, weekend warriors, and just-learning-to-bike-ers in the Ohio City neighborhood and beyond over the years, providing a resource and support network to bikers new and old to the city. True to their name, OCBC started out as a members co-op but they’ve since moved to open their doors to just about everyone, not just members. “We want to be more like a public library, but every public library has a security guard and we don’t,” Jim says, alluding to the openness the Co-op has to the community. Neighbors come together to work on their bikes, learn from volunteer mechanics, and step up to help clean and maintain the space. Co-op members bump into each other, work with each other, and are actively in community with each other; no hushed whispering, only the loud cacophony of community. Implicit in the Co-op’s values, Jim says, is encouraging people to move from driving to biking where they’re able to. Cleveland hasn’t always been a biking town, but the city has installed more and more bike lanes, and the Co-op places an important role in the neighborhood creating a space to get quality bikes, and learn how to care for your bike. Jim says it’s true that for some people, all they need are the tools they need and they’ll be happy to tinker away at their bike. But for others, they might need a little extra resources and support to encourage them to regularly use their bike and keep it maintained. 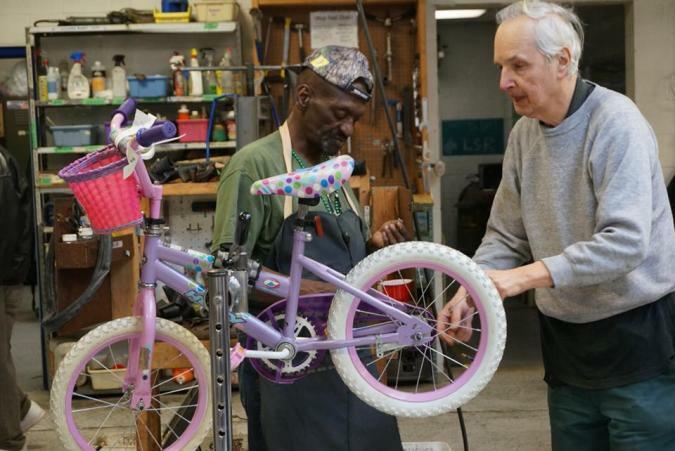 “If someone wants somebody to work on their bike for them, but it’s five miles to the nearest bike shop and you don’t have a car, you’re not riding your bike,” Jim says. OCBC hopes to change that, and help encourage people to try an active commute on their bikes. Looking to revamp the Co-op’s workshop and update their tools, Jim came across a stumbling block. “When we asked [foundations] for some money to buy tools, they said ‘That’s not really the kind of thing that we do. Why don’t you go to ioby?’” he recalls. So Jim submitted an idea and worked with ioby to strategize OCBC’s crowdfunding campaign, and stretched his crowdfunding muscles more than he’d ever done before. “When we extended the closing date to the end of the year, I did something that I have never wanted to do in the past, which was multiple asks for the same donation purpose,” Jim recalls. “I asked once before Christmas, and then once the next week, and then again the day before New Years and that was what got us to our goal.” With that stretch, and the Co-op’s members rising up to meet the challenge, they crowdfunded enough money to replace some of their 15 year old equipment in the workshop and send Al, their head mechanic, to a training program to expand the types of services and trainings the Co-op can offer. 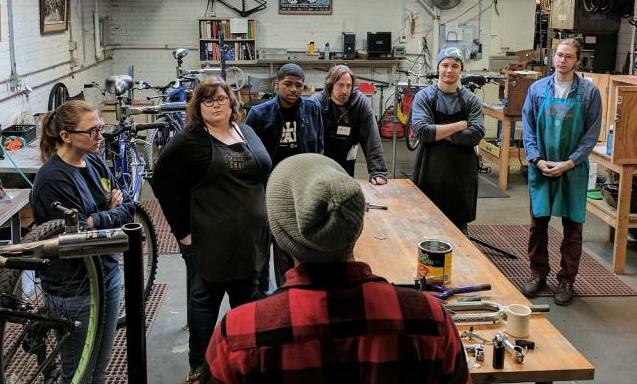 Having finished crowdfunding, the Co-op is poised to offer new bike maintenance classes, offer more tools to their bikers, and gear up for even more years as a community hub for Cleveland’s bikers.